Yvonne Hollenbeck of Clearfield will be one of the featured poets at the national cowboy poetry gathering Jan. 29-Feb. 3 in Elko, Nev. This is an international festival that honors the arts, culture and traditions of the rural west. 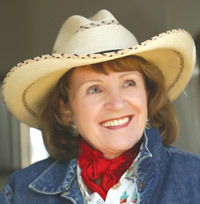 Hollenbeck writes poetry about her life on a ranch where she helps with everyday duties. Although her poetry is often humorous about situations that were not humorous when they happened, her writing also takes a serious side when she reflects upon the hardships experienced by her parents and ancestral family members.